Siliguri, March 4: Bhupendra or Pradip Pradhan, the GTA chairman and Gorkha Janmukti Morcha leader, was arrested last night by Siliguri police for alleged involvement in trying to sell a fake antique coin to a Jalpaiguri resident. 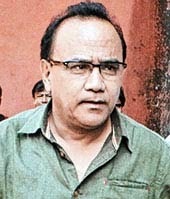 Bhupendra, better known as Pradip, has been remanded in jail custody for five days. Ten other persons were also arrested in the case from the same Siliguri hotel where Pradhan was found. Pradhan and his party have alleged that the arrest was politically motivated and he had been falsely implicated in the case. Sources said, last month, a Jalpaiguri resident had struck a deal with two youths for an "antique coin". "On February 23, Ravi Kithania from Jalpaiguri had approached Sanjib Maitra of Baghajatin Colony in Siliguri, and Sachin Biswakarma, who is from Gorubathan in Kalimpong subdivision. Kithania had learnt that the duo had an antique coin and agreed to pay Rs 13 lakh for it. The same day, he paid an advance of Rs 50,000 to the two youths and it was decided that on March 3, he will pay the remaining amount and the coin would be handed over to him," O.G. Pal, the deputy commissioner of Siliguri metropolitan police, said. "We are yet to collect information about Kithania on whether he is a coin collector and why he agreed to pay such a hefty sum for the coin. We have seized the coin from the two youths," she said. Police sources said the two youths had claimed that the coin with them was a "rice puller coin" minted by the East India Company in 1818. The rice puller coins, made of iridium and copper, are attributed various properties, seemingly magical, but with no scientific basis. Yesterday, Kithania and one of his friends reached the hotel at Darjeeling More here for the coin. "They met Sachin and Sanjib, along with nine others, including the GTA chairman. The two youths introduced the nine others as associates. When the coin was shown, Kithania's friend, who had some knowhow on antique coins, examined it. He declared it was a fake. They asked the youths to return the money that was paid in advance," the police source said. Sachin and Sanjib allegedly expressed reluctance in returning the money and insisted that the coin was an original. Kithania informed Pradhannagar police station and later, filed a complaint alleging cheating against all 11 persons, including Pradhan. Following the complaint, Pradhan, Sachin and Sanjib and eight others were arrested. One of the arrested is Deep Thapa, a member of Gorkha Janmukti Yuva Morcha. "Charges under Sections 120B (punishment for criminal conspiracy) and 420 (cheating and dishonestly inducing delivery of property) have been brought against them. The court ordered five days' police remand to Sachin and Sanjib. The other nine have been remanded in jail custody for five days," Sudip Roy Basunia, the assistant public prosecutor of Siliguri, said. Pradhan, a GTA Sabha member of Phoobshering-Pandam constituency near Lebong in Darjeeling, said he was innocent. "It is a conspiracy by the administration against me. I have been wrongly implicated," he said. Morcha assistant secretary Binay Tamang said the incident looked like a political conspiracy. "Our party has planned a dharna in Delhi from March 9 to 17 and the timing of the arrests suggests it is a political conspiracy to thwart our agitation." Bhupendra or Pradip Pradhan, the GTA chairman and Gorkha Janmukti Morcha leader, was arrested last night by Siliguri police for alleged involvement in trying to sell a fake antique coin to a Jalpaiguri resident.